We are a special office in the middle of Germany. For more than one decade we have been active for unknown heirs, estate curators and probate courts at home and abroad. We conduct research and render services for the clarification of legal issues. We offer knowledge in historic, geographic and emigration related matters which is required for obtaining sources for target-oriented researches in the genealogical field. This also assumes the legibility of several historical writings and the knowledge of Latin language. Our work also takes us into daily contact with the historical events of the last century. We develop own large archives by purchasing of sources and by permanent completion of our data bank. We are specialised in research, reconstruction and documentation of biographical data as well as drawing up of ancestral charts. This all enables us to clarify even the most ramified family relationships world-wide and to provide court-accepted documentation. 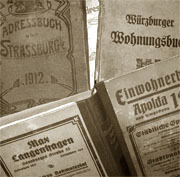 By our big genealogical library (directories and telephone directories of former German settlement areas, emigrant lists, chronicles of places, deposits of church registers and directories of register offices, historical atlases, local books etc.) and in connection with the most modern information technology we can conduct effective research following the order acquisition. Our numerous historical records ensure a fast access to sources of information, connected with an access to world-wide family-historical data banks. A permanent exchange of experiences of our experts connects us with a lot of national and international associations and archives. We are supported by a world-wide net of correspondents and experts. In preparation of inheritance proceedings we cooperate with notaries and sworn interpreters. Costs incurred for mandated by us lawyers and tax accountants in handling sale and economical distribution of inheritance are a component of our fee. Also here shows it that a heir finder should have not only abilities in the area of heir finding, but just, also because of the often not less difficult economical processing of estates (sale of valuables, properties etc. ), he should have enough knowledge and “Manpower” in this area. Heir finding is marked by individuality and precision. Basically the necessary investigations are pursued in all lines and clans of the case of inheritance. Thereby is intended an indispensable completeness of clarification for the processing of inheritance. Of course, confidentiality and protection of professional secrecy are guaranteed. The actions of our company are characterized by great interest in research, sense of justice and respect for human legacies and destinies. We prefer exclusive orderings, because they render possible loyalty, transparency, quality and a trustful cooperation. The community of heirs is often a steady stronghold of quarrels and resentment of his members among themselves. The legislator has not structured the community of heirs as a compelled community, but has intended their discussion. Disunity about the distribution of the inheritance often leads to the property damage of all people involved in the inheritance matter and to lasting conflicts within the family. Therefore, we offer as a complex service also the distribution of the inheritance to the members of the particular community of heirs within the agreed fee. Please, do not hesitate to address to us with arising questions personally. A continuous support of facilities, associations, clubs, schools etc. with financial donations expresses our social charge. Throughout Germany these include the German Red Cross (DRK) and the German Federation of the War Graves Commission (registered association). Local we have charged the “Animal shelter Gera” (editorial published in: Thüringer Landeszeitung of 06.06.2007), the dog squad of the Workers’ Samaritan Association in Arnsgrün, district Greiz (editorial published in: Ostthüringer Zeitung of 02.07.2010), the sports club “Hainberger SV Greiz” (editorial published in: Ostthüriner Zeitung of 09.07.2010), the sports club “TSV 1880 Gera-Zwötzen” and the Liebe-Grammar School in Gera.